Introducing the Amazing Pocket Chair As Seen On TV, the convenient & compact chair that folds up easily and fits right in your pocket! Light weight yet heavy duty the Pocket Chair As Seen On TV opens up in a snap, and folds up with ease. Take a seat anywhere with the pocket chair. Take it to the park, the beach, the big game, tailgating, camping, golfing and its also perfect for gardening. No more sitting on the ground. No more standing around. No more bulky folding chair frustration. The secret is in the Dual-Action Counter-Rotational Support System, that gives it the strength of steel the comfort of a chair and fits right in your pocket. Holds up to 250lbs. Don’t get twisted up with complicated contraptions. 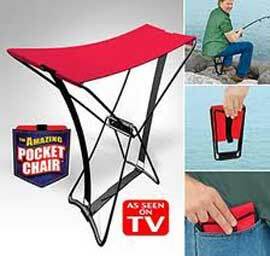 Get the the amazing Pocket chair that fits in conveniently in your handbag, glove box, knapsack, golf bag even your tackle box! or load up your drawer for a Pocket Chair kids party. You can sit anywhere with the Pocket Chair! Put one in your pocket today! When you order The Pocket Chair Compact Chair today for only $14.99 + $7.99 P&H, we’ll send a second one FREE, *just pay separate $7.99 P&H! Each chair comes with a handy carry case!